Fred Good was born in Pittsburgh, Pennsylvania, of Belgian parents in 1940. He and his two younger brothers spent their early years attending public and private schools in Philadelphia, Pennsylvania, then Greenwich, Connecticut, Jacksonville, Florida, and Savannah, Georgia. Fred with R. Buckminster Fuller at the University of the Streets, New York, 1968. Both Fred and Mike, were drawn to the arts as adults. 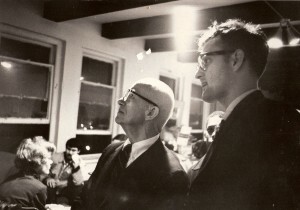 Mike was married in 1969 and moved to Maine, becoming a successful jewelry designer and sculptor, while Fred remained in New York City as a community organizer, while also studying drawing (Arts Student League), poetry (with Robert Boardman Vaughn) and psychology (with Jacob Moreno, founder of psychodrama). Fred was instrumental in helping to start a number of non-profit organizations, including The Real Great Society, The University of the Streets (a name Fred coined) and the Lower East Side Community Music Workshop, which is now a small private foundation supporting music projects . The upper Lower East Side neighborhood is also now referred to as “Loisaida”, a name coined by Carlos (Chino) Garcia and the late Bimbo Rivas, two friends and activists with whom Fred has been closely associated. Fred and Chino continue their friendship and involvement in Loisaida today. From 1946 through the mid 1960’s, Fred and his brothers spent their summers in Belgium on their grandparents’ estate. There they were exposed to the arts, receiving lessons in music, drawing, painting and sculpture. However, it was not until Fred moved with his wife and six year old daughter, Jessica, to Chapel Hill, NC, in 1981, that he pursued painting full time, studying watercolor at The Art School (now the ArtsCenter) in Carrboro, NC, and at the Durham Art Council in Durham, NC. Fred joined the Watercolor Society of North Carolina in 1984, serving as its Treasurer from 1985 to 1987. During this period he was accepted in numerous juried shows throughout North Carolina, often winning awards, and sold his paintings through galleries in Winston-Salem, Rocky Mount, Fayetteville and one person shows in Chapel Hill and Carrboro, NC. During the past five years, Fred has divided his time between painting and publishing. During 1987-88, Fred served as President of Center Gallery in Carrboro (which became part of the ArtsCenter) and served as Board Chairman of The ArtsCenter in Carrboro from 1990-96. The Gang and the Establishment by Richard W. Poston; Harper and Row, New York, 1970. Chapel Hill Newspaper; miscellaneous articles between 1990 thru 1996.